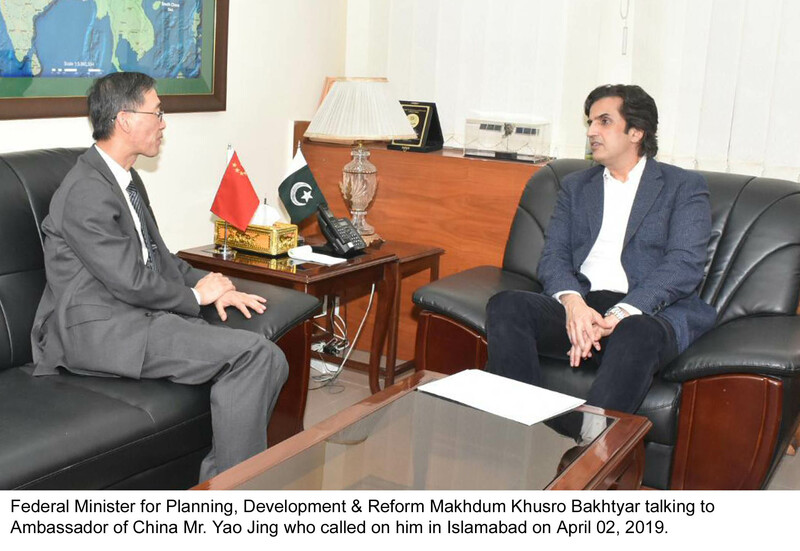 ISLAMABAD, April 03, 2019: Federal Minister for Planning, Development & Reform Makhdum Khusro Bakhtyar has said that the present Government is focusing on developing the agriculture sector on modern lines to improve the livelihoods of small farmers and enhance its contribution in the national economy noting that agriculture constitutes the largest sector of economy. He stated that in this regard agriculture cooperation with China will be enhanced under CPEC framework. 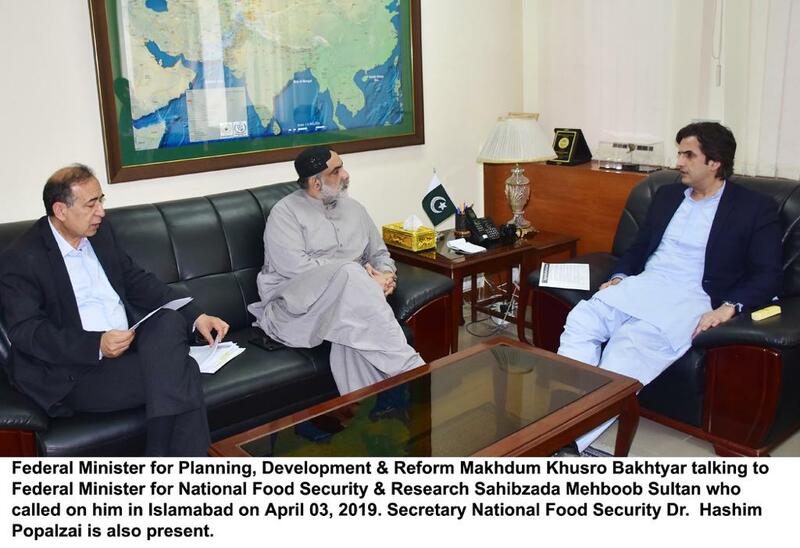 The Minister was talking to Federal Minister for National Food Security & Research Sahibzada Mehboob Sultan who called on him in Islamabad on Wednesday. Secretary Planning Zafar Hasan, Secretary National Food Security Dr. Muhammad Hashim Popalzai and Project Director CPEC Hassan Daud were also present in the meeting. Minister for Planning said efforts are underway to initiate joint ventures with leading Chinese agriculture companies in various sectors of agriculture to enhance agricultural output and value addition of agricultural products for mutual benefit of both countries. He highlighted that there was a lot of scope for increasing cooperation between the countries particularly in areas of livestock, fisheries, citrus, mango, rice, potatoes and horticulture. 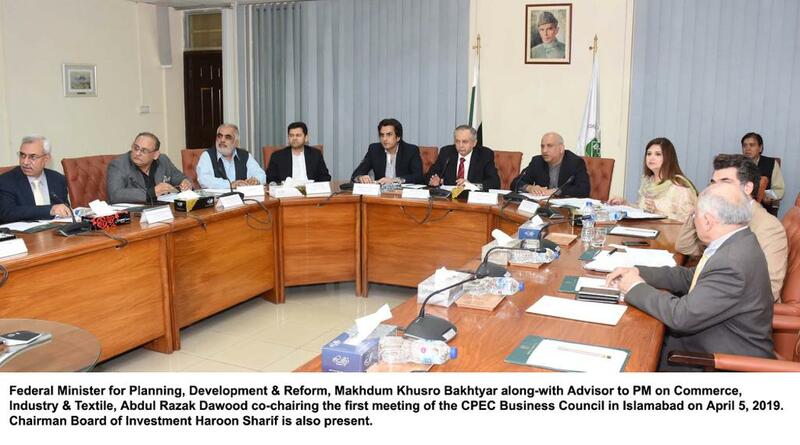 Makhdum Khusro apprised that CPEC Business Advisory Council has been constituted which will have representation from leading companies dealing in various sectors including agriculture the purpose of which will be to identify new areas for future collaboration with China under CPEC. During the meeting, deliverables in different areas of agriculture for the proposed visit of the Prime Minister to China to participate in the second Belt & Road Forum this month came under discussion. It was discussed that a Memorandum of Understanding (MoU) on Foot & Mouth Disease is also expected to be signed during the Prime Minister’s visit.